Our newest guest contributor is Chad Brealey – outdoorsman, conservationist, food lover, writer and actor. Chad has recently created Salt, Fresh & Field – a broadcast television and online program borne from the realization that food comes from some of the most beautiful places in the world. SF&F tells the stories behind the collection and cooking of food – from hunting and fishing to urban gardening (including snails) and mushroom hunting. www.saltfreshfield.com – ed. Nearly every salmon returning to British Columbia each year ventures into shallow water at most northern tip of Haida Gwaii – Langara Island before splitting off to wind their way to their home rivers to the south. The first to arrive in May are the Chinooks. If all goes well and the feeding grounds have been kind, Chinook can live to seven years and exceed 110 pounds. Born from large rivers and their tributaries, Chinook have the weight of history behind them as the revered Tyee and king of pacific sport fish. Each year, anglers from across the globe descend by helicopter to remote fishing lodges on Langara Island to unleash their hope. I had the opportunity to visit Langara Fishing Lodge this past May and fished for Chinook by myself for the first time in many, many years. Solo salmon fishing is a completely different exercise than trolling with a partner or guide. Every single doubt or question is amplified. Necessarily though, every success is much more grand. 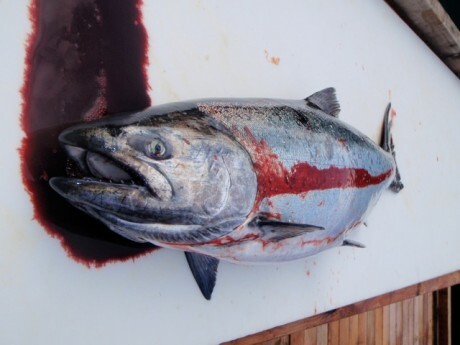 Large Chinook don’t school with their smaller, 20 pound brethren. 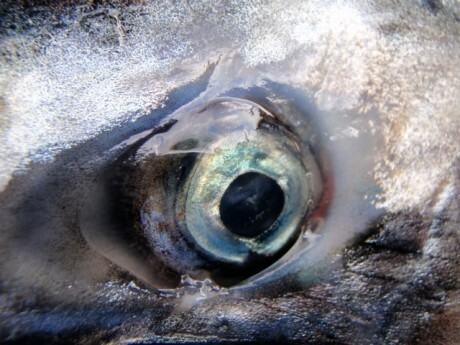 The Tyee’s – the 30+ pound story-makers are loners – they duck into sheltered corners following bait fish and shelter. They lurk in the shallow kelp beds just off shore, slowly cruising tidal currents. This makes them accessible to anglers using cut-plug herring as bait, an 8oz weight and 30 feet of line. silver colour will fade to a steel grey and its eyes will cease to be round and fall flat. It will go from a perfect oceanic machine to the ideal meal to celebrate living on the west coast. Treat it with the respect it deserves – it traveled a hell of a long way to get to your table. Filet salmon and remove pin bones. Piece into serving sized portions. Heat a thin layer of grapeseed oil in a cast iron pan. (probably around 3-4 minutes).The flesh should not stick at this point so will be easily removed to turn. Place the skin side down on the pan. Place in 400F oven for about 6 minutes or leave on the hot burner for an additional 6-8 minutes (depending on thickness). The salmon is done when it is easily separated with a fork. Serve with salted boiled new potatoes, summer greens and a good pinot noir. If you have the option of the keeping the salmon head, do so. Make salmon head soup. It is shockingly good and about as easy as boiling water. Season entire head with coarse salt. Place in pot and cover with enough water to cover. Reduce to simmer and cover for 45 minutes. Remove bones and clean meat from connective tissue and return to pot. Use as stock or straight broth. Thanks for the article Chad. Question for you: I have about a dozen sockeye heads and de-filleted bodies in the freezer. How much water to salmon parts do you figure I should use for a good batch of stock? I’ve always made my stock with the bodies and soup with the heads. The meat from the head is more fatty and dense than the rest of the body and deserves to be on its own. You can certainly combine the two but I really recommend trying it separately. I assume you’ve already done this but be sure the gills have been removed from the heads. Things go badly when the gills are attached. As for the amount of water – for salmon head soup, I’d recommend a wide based pot and enough water to cover the heads. Not exact I realize but based on the number of heads and the potential size difference between three 30 lb chinook and three 7lb sockeye there isn’t really a perfect ratio. As for the body stock, I’d recommend about an inch above the volume of the stock ingredients (bodies, carrots, leek, celery, etc.). That’ll allow for the requisite reduction and flavour density.